Should I Use Or Not Use? And understandably. With next to no advice about how to properly use them, other than what the pet store staff member (who is almost always unqualified to do so) may try to explain, you are left to sink or swim on your own. Here is a little information on all these different dog training collars, to help you get started on making the choice of what is right for your dog. This will also show you what dog training collars I use and recommend, and what ones I don't use (as well as why not!). You're probably also wondering how to make the right choice for your own dog. When choosing a dog training collar, I always first look at the dog's temperament. Not the dog's size? Or breed? Nope. Just because a dog is a Rottweiler doesn't mean that she needs the firmest training collar. If she has a soft, "meek" temperament, it will be just fine to train her on a flat-buckle collar! This is the collar that most people are familiar with and use. 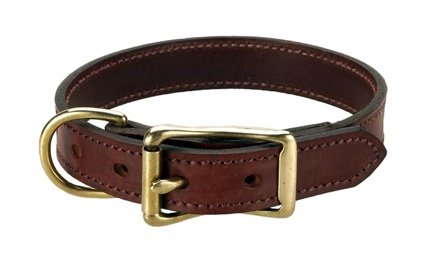 It is simply a strip of leather, nylon or a similar material that goes around the dog's neck and is fastened with either a brass buckle or a plastic clip. Pretty simple to figure out! 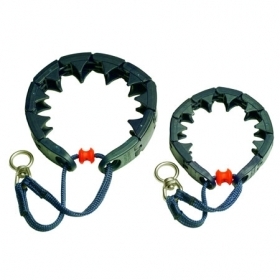 We use this dog training collar for tying dogs outside, as they can't hurt themselves on it. Also, it is good for training puppies under 3 months of age, as well as very 'soft', introverted, meek dogs (i.e. rescue dogs that have been abused). We only use flat-buckle collars that have the brass hardware, as the plastic clips tend to pop open when sudden pressure is applied (i.e. your dog lunges after a squirrel). This is the collar that most people are familiar with and use. It is simply a strip of leather, nylon or a similar material that goes around the dog's neck and is fastened with either a brass buckle or a plastic clip. Pretty simple to figure out! Somewhat similar to a flat-buckle, this dog training collar is usually made of nylon, which goes about 75% around the dogs' neck. The remaining 25% is made of chain, which can be loosened and tightened with a flick of the wrist. It comes in different sizes, from small to large and sometimes extra large. The martingale training collar is adjustable, which is also a drawback - you need to loosen and tighten it each time you put it on or take it off your dog. While you can buy collars with a clip as on this photo, these are more likely to break open than one that has a buckle or is a solid collar all the way around. I recommend using this collar only for dogs over 3 months old. Nylon martingale dog training collar. Somewhat similar to a flat-buckle, this dog training collar is usually made of nylon, which goes about 75% around the dogs' neck. The remaining 25% is made of chain, which can be loosened and tightened with a flick of the wrist. Sometimes called a "pinch" collar, it doesn't actually pinch your dog. Because the links go all the way around your dog's neck, the pressure is distributed evenly instead of constantly being applied to the same spot on his neck (like a choke chain). This dog training collar comes in small, medium or large links. Just because you have a small dog, doesn't mean that you need a small link prong! Contrary to what the pet store staff member may tell you, the smaller the link, the firmer the correction. This is because the links are closer together (more pressure points). A correction can easily be given with a simple flick of the wrist, so not much "muscle" is needed to train your dog. Your dog will never outgrow this dog training collar, as links can be added or removed as needed. If you have trouble putting it on your dog, you can buy one with a quick release. Always buy a collar that has round tipped links, as opposed to flat tipped ones. Round tip links are smooth, and won't hurt your dog's skin or damage their fur. Never crate or leave your dog alone with a prong on because a paw could get caught under it and injure him, making him afraid of it! Many people assume that a prong collar is only used for large, strong dogs. This isn't actually true. It all depends on your dog's temperament. You could have a huge Bullmastiff that has a soft temperament, which I would likely train using a flat-buckle or martingale collar. 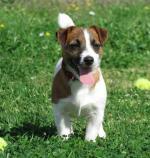 On the other hand, you may have a small but feisty Jack Russell that I would train using a small link prong collar. We use these collars on dogs over 3 months old, as training results are great with them. And ask any one of our students - they are very humane... when used in properly trained hands!!!!!! They only become inhumane when an owner who isn't trained uses one on his/her dog. This dog training collar is actually just a prong collar, but with a plastic casing that covers the prong. They are more appealing to the eye. I don't use this type of collar. Why a prong and not this one? The reason is because the plastic tends to pop open very easily, making them not very reliable (imagine - your dog lunges at a squirrel... and the collar pops open, leaving your dog on the loose). A plastic triple crown training collar. This dog training collar is actually just a prong collar, but with a plastic casing that covers the prong. They are more appealing to the eye. I don't use this type of collar. Most people can name this collar, as a lot of people use them. A type of this collar is often used for showing dogs as well. This dog training collar is a chain that goes completely around the dog's neck, with two rings at the top. To properly put on your dog - remember, P for puppy. When you hold it up, ready to go on your dog's neck, it should form a P, with one ring at the bottom of the P, and the other half way up the long stick of the P. Otherwise it won't release after a correction and will choke the dog. We don't use this type of dog training collar either, because corrections are hard to give with it (especially for novice trainers) and it tends to damage your dog's fur. This is actually not even a dog training collar, but a head halter, like what a horse wears. With a nylon strap going around the dog's neck and one around his muzzle, it steers the dog in the direction you desire. I do not use or recommend this type of device, as it restrains the dog beside you instead of training him to follow you. Dogs will usually spend so much effort trying to paw and rub it off his muzzle that any learning is hard to come by. This is actually not even a dog training collar, but a head halter, like what a horse wears. With a nylon strap going around the dog's neck and one around his muzzle, it steers the dog in the direction you desire. Also, it tightens and pulls the dog's head to one side whenever he tries to pull ahead of you, which is dangerous for his neck and spine. If your dog were ever to lunge after a squirrel or to greet someone on the street, the result of jerking his head to the side like that can cause neck and spinal injury. Another device, the Lupi is a dog harness that "hobbles" your dog's front legs. Whenever he tries to pull, the harness tightens around his legs. It is also a restraining device, like the Gentle Leader. 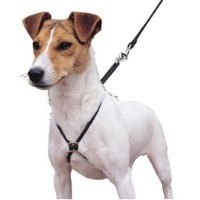 Once the harness comes off, the dog can immediately feel the difference between that and a regular collar, and the unwanted pulling will come back immediately. It does not train your dog, but restrains him. And you guessed it - I don't train with these either! By now you may have noticed that I only use dog training collars that are humane, non-restrictive or restraining, and that can be phased out to a flat-buckle or no collar once the dog is properly trained. Don't expect this to happen overnight! Like all good things, it takes time. Lupi harnesses are not the best training tool. Another device, the Lupi is a dog harness that "hobbles" your dog's front legs. Whenever he tries to pull, the harness tightens around his legs. It is also a restraining device, like the Gentle Leader. A Lupi harness is not a recommended dog training tool. I call this an "invisible leash" - a leash does not attach to the collar. 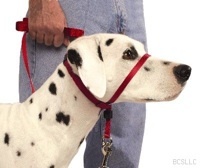 Worn snugly around the dog's neck, it has two posts that should touch the dog's skin. When a button on the transmitter (in your hand) is pressed, a static correction is given to the dog. The correction is basically a muscle stimulus that the dog will feel around his neck. Worried that you'll hurt your dog? Try it on your hand - I have! What you will feel is similar to what you feel when you get a shock after touching a door knob (static). It is completely humane. I would never use it if it wasn't. Yes, that's right... 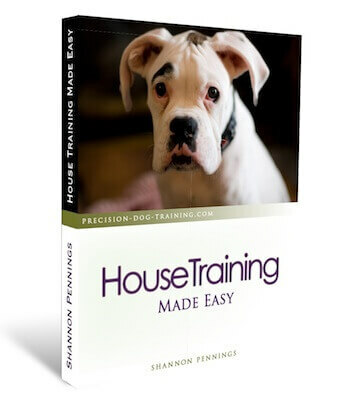 I use these remote training dog collars as well! 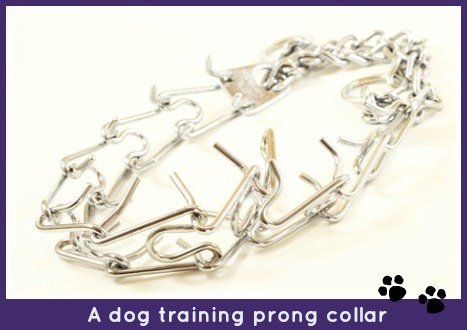 Do not use this type of collar until your dog has been trained for at least 6 months. I use them in the Intermediate to Advanced Level, when they start doing off-leash obedience, such as long distance recalls. It's also great for troubleshooting behavior problems such as aggression. Once again, in the proper hands they are wonderful tools to further a dog's obedience training. Please do not attempt to use this collar without professional training! 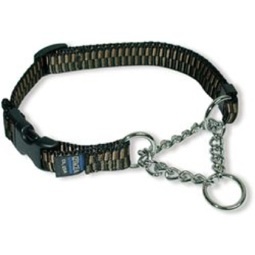 This last type of dog training collar that we'll look at is a "dog barking collar". It's also hands-free, and doesn't require you to push a button for a correction to occur. When your dog barks, the sensor on the little box under your dog's chin causes it to automatically correct the dog. There are different types of anti-bark collars. A citronella anti-bark collar is good for 'softer' dogs - it sprays citronella upwards in front of his face, startling him into being quiet. An automatic electronic anti-bark collar is better for a stronger, 'harder' dog. As with the citronella collar, it corrects the dog automatically when he barks, using a muscle stimulus correction (like the e-collar). Both of these collars work well, and are often used in our training for dog barking control. Want an easy way to keep up-to-date on new training articles that are added to our site? Sign up for "The Yellow Hydrant", a monthly selection of dog tips and techniques that is only for subscribers! Best part... it's totally free! To join the rest of the dog people, fill out the form below.